PORT-AU-PRINCE - The head of the new United Nations Mission for Justice Support in Haiti, known as MINUJUSTH, has said the operation will carry out its work in an innovative in the island nation – complete with an unusually tight timeframe and a bench-marking exit strategy. “The new mandate by the [UN] Security Council is to work with the Government of Haiti to strengthen its rule of law intuitions. 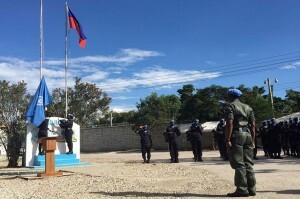 It’s also to continue to support the HNP, the Haitian National Police, and to work on justice and human rights – and that includes human rights reporting, monitoring and analysis,” she told UN News. MINUJUSTH is also unique in that its mandate calls for a benchmarking exit strategy. “Within two years, we can figure out how we [will exit the country] but with benchmarks for progress that can be measured,” she stressed. The mission head stated that the country team created a framework with a focus on the Sustainable Development Goals (SDGs), which, along with SDG 16 – to promote just, peaceful and inclusive societies – is working in conjunction with the Haitian Government. Page explained that while MINUJUSTH is almost exclusively based in the capital, Port-au-Prince, it will also have a ‘mobile approach’ that will take teams into the field – reaching the greatest number of people. The mission chief told UN News that the teams will focus on peace, justice and rule of law, to help the people figure out their needs, and then connect them with top-level political figures to see how the UN can help the Government address those needs. “Once they have a baseline of what the people are looking for, what they need knowledge about, we hope that this bottom-up and top-down approach will help Haiti to strengthen its own institutions with a bit of push from us,” she explained. “Now that Haiti has its elected officials at all levels, including at the lowest levels in the communes, we have something to work with,” she said. As for the ongoing combat against cholera in the country, Page expressed hope to get to zero transmission. “One of the ways we continue to work is through the country team,” she said, mentioning the Pan American Health Organization (PAHO), UN Educational, Scientific and Cultural Organization (UNESCO), and the UN Children’s Fund (UNICEF), which are working to strengthen sanitation and water systems.